A Billionaire Governor Says Protests Don't Matter. He's Wrong. "If protesting solved problems, Illinois wouldn't have any problems." That's what Governor Bruce Rauner, a billionaire Republican politician and former private equity executive, had to say when 10,000 concerned citizens journeyed to the Illinois capital on May 18 to oppose his destructive policies. The governor had already sped out of town by the time thousands of marchers set off through the streets of downtown Springfield. Clearly he wanted to convey that he had no interest in hearing their concerns, much less heeding them. But, of course, Rauner couldn't really escape. As soon as he arrived at his destination, reporters began grilling him about the overflow crowd that jammed the street (and every other available space) in front of the Capitol. That's when he professed his contempt for the value of protests--demonstrating a shocking ignorance of the history of our nation. Weren't the American colonists who challenged British rule engaged in one of our country's pioneering protests when they marched down to Boston Harbor for that incendiary Tea Party? Of course that action alone did not drive out the Brits. But it did inspire countless colonists to enlist in the battle for freedom and liberty--a battle that, in case our governor hasn't noticed, was indeed eventually won. That's the thing about protests. Seldom does one march, one rally or one sit-in bring about systemic change. But the accrual of such actions educates, inspires and conveys a sense of urgency. Each protest builds on the one before. And it is this growing intensity that demands attention and achieves action. Protests are potent messages delivered in human form that can shake the complacency of the powerful and lift the spirits of the disempowered. The simple truth is that protests have been an essential element of every successful movement for social and political change. We need only reflect on the civil rights movement and the vast transformation it has effected in our own lifetimes. Would change on that scale--the dismantling of an entire system of legally sanctioned segregation and discrimination--have been possible without the moral authority and passionate conviction expressed in the innumerable actions of protest, from lunch-counter sit-ins in the smallest of towns to massive marches in our nation's capital? Or we can think back on how workers in our country gained the right to join together in unions to improve their lives. Standing against an entire corporate class bent on denying their right to have a voice on the job, millions of workers all across the country walked picket lines, went out on strike, and even occupied their factories until the day finally came that the corporate elite could resist no more. 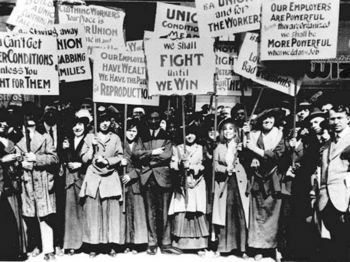 Today we too often forget the workplace struggles and tumult that shook the entire country during the late 19th and early 20th centuries, but there is no denying that those multitudes of protests were essential to forging the rights workers have today. Now we are in a battle to defend those rights here in Illinois. That is why the thousands of union members, human service advocates, and other concerned citizens thronged the State Capitol. We came to protest Rauner's budget blockade that is forcing program cuts and layoffs at social service agencies and state universities, his efforts to annihilate basic collective bargaining rights, and his refusal to negotiate with his own employees in state government. We came to stand in solidarity with workers injured on the job whose benefits Rauner wants to cut, with construction workers whose right to a "prevailing wage" he wants to take away, with home health aides whose overtime hours he wants to eliminate, and with students whose college assistance grants he has blocked. We came building on dozens of smaller protests that have been held at the Capitol in recent months--by university students, the homeless, child care providers, disability advocates, domestic violence survivors, clergy, and scores of others harmed by the governor's insistence that laws to diminish workers' rights must be passed before he will allow passage of a state budget. We used our vacation time or took a day off with no pay. We got up at dawn to make the bus or packed our cars full of co-workers or rode in on our motorcycles. We scrambled to find child care or brought our children along for a great lesson in civic engagement. We came with canes and walkers, even in wheelchairs. And many of us who couldn't make it followed it all on Facebook or Twitter, and joined in the cheering from afar. Will that one day of protest--even such a mighty day--turn Rauner around? Not very likely. But this much is certain: We sent a message of unity and determination that will build a stronger fighting force for the battles to come. So yes, Governor Rauner, protests do solve problems. That's what history has shown time and again. That's why we'll keep standing up together in our worksites, in our communities and at the State Capitol until we have gained the fair treatment that all working people deserve.